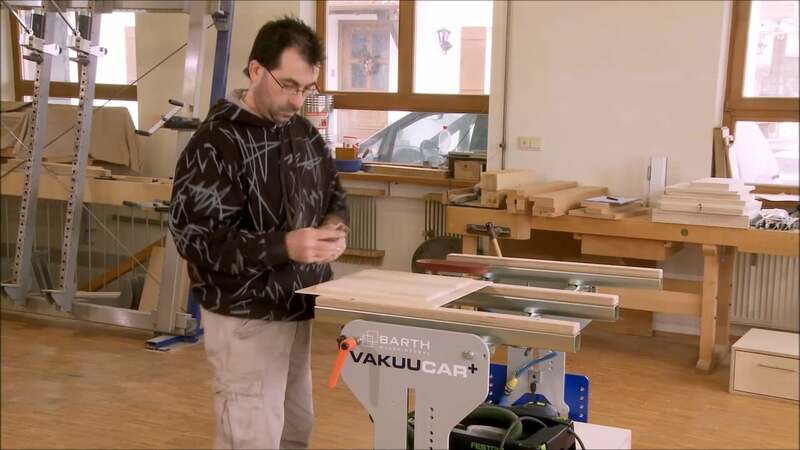 The Barth VakuuCar+ is a mobile workstation with built-in vacuum clamping. With the VakuuCar, your bench can move around with you, and handle and clamp any material at the height and position you want it at. This time and space-saving cart enables you to get the most out of your time in the shop. Designed and made in Germany, Barth VakuuCar+ work stations are built with exceptional engineering and robust quality to save shop time and money in hand-working and moving all types of work pieces. With its adjustable surfaces and easy-to-operate foot pedal clamping, it also provides better ergonomic positions for woodworkers, especially when clamping awkward shapes, nonstandard materials, or pieces ordinarily too large for one person to handle. All models feature adjustable heights for the rubber-protected vacuum clamps, which are operated effortlessly with a pedal-valve vacuum clamping system that can hold all materials, shapes, and sizes with a powerful hold. Even heavy solid-wood doors or panels can be held firmly by the vacuum clamps. While the grip is firm, the clamp pads won't scratch or damage your workpiece; clamping materials like glass with no risk of scratches or breaking provides you with new possibilities and time savings that would have been impossible before.The Easy Motion system adds a foot pedal-operated hydraulic lift element to the table to raise or lower the tabletop. This larger VakuuCar delivers the same great features as the original in a larger surface area for more heavy duty shops.